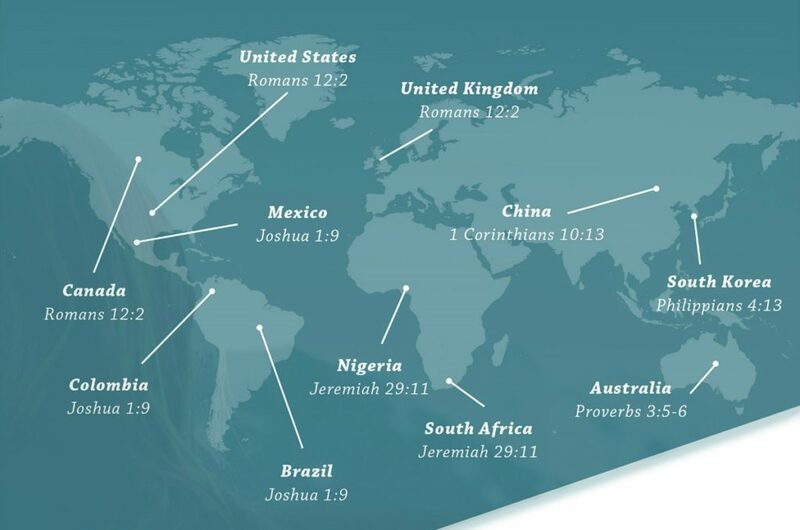 What are the most popular Bible verses from across the world? YouVersion Bible app has released its results. 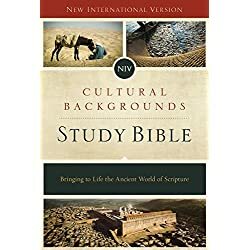 Every second, people in the world conduct more than 40,000 Google searches, they create 5 new Facebook profiles, and they open the YouVersion Bible App 112 times. That may not seem like a lot but that equals 9,676,800 uses every single day. That’s a lot! In that same second, three bookmarks are created, four verses are shared, and 18 verses are highlighted. The equivalent of more than 50 Bible chapters are listened to, and 342 chapters are read. 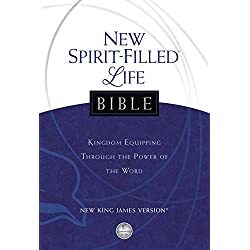 The YouVersion Bible app was launched by Life.Church in 2008. They have just announced that the Bible app has topped 200 million installs. 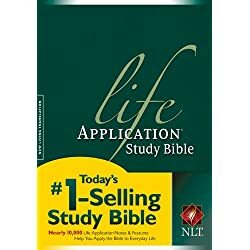 The app now offers the Bible in more than 1,200 versions and 900 languages. Here are some interesting facts they have compiled about what people’s favorite Bible verses are. They didn’t differentiate between translations so I am using the NLT for these examples. Likewise, Nigeria, South Africa, and the Philippines all engaged the most with Jeremiah 29:11. 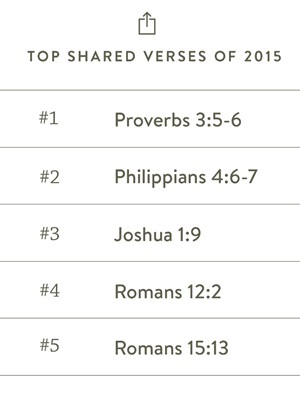 The people at YouVersion also broke down which verses were shared the most over email, text, and social media. Here are the top 5. Philippians 4:6-76 Don’t worry about anything; instead, pray about everything. Tell God what you need, and thank him for all he has done. 7 Then you will experience God’s peace, which exceeds anything we can understand. His peace will guard your hearts and minds as you live in Christ Jesus. Romans 12:22 Don’t copy the behavior and customs of this world, but let God transform you into a new person by changing the way you think. Then you will learn to know God’s will for you, which is good and pleasing and perfect. YouVersion added a feature in 2014 to foster a communal experience for readers. Friends can also choose to see each other’s highlighted verses, bookmarked passages, and notes. You can learn more about the YouVersion Bible App here. Previous articleTracy Morgan: God Said "Your Room Ain’t Ready."